LeBron James will be the second player in NBA history to win four MVPs in a five-season span.The King has been crowned once again. League sources confirmed to ESPN that LeBron James will be awarded his fourth MVP award on Sunday. It will be his second straight MVP and fourth in five seasons. James joins Kareem Abdul-Jabbar (6), Michael Jordan (5), Bill Russell (5) and Wilt Chamberlain (4) as the only players to win at least four MVPs. Russell is the only other player to win four awards in a five-year span. LeBron had a historic season, averaging 26.8 points, 8.0 rebounds and 7.3 assists this season. Only five players in NBA history averaged at least 26 points, eight rebounds and seven assists in a season: Oscar Robertson (5 times), John Havlicek (twice), Larry Bird, and Michael Jordan. James is the only player to average those numbers while also shooting at least 55 percent from the field. LeBron won the award despite not leading the league in points, assists or shooting percentage this season. But no player created more points this season. James scored or assisted on nearly 44 points per game, the best in the NBA and two more points per game than Kobe Bryant. He shot a career-best 56.5 percent from the field, more than three percentage points better than last season. That rate also was the eighth-highest field goal percentage by an MVP winner, and the best among non-centers to win the award. James did top the NBA in Player Efficiency Rating, a statistic that takes into account offensive and defensive box score statistics on a per-possession basis. James has led the league in PER in each of the last six seasons. This season his PER of 31.6 was the seventh-best all-time but only the second-best of his career. Amazingly, LeBron now owns four of the top 11 PER marks for a single season in NBA history. Win shares is a statistic that quantifies a player’s impact on his team wins by looking at his individual box-score statistics in the context of his team’s offensive and defensive performance. Though James’ 19.3 win shares this season ranked “only” 20th all-time, just three players in NBA history have accumulated more win shares through their first 10 seasons than LeBron – Chamberlain, Abdul-Jabbar, and Oscar Robertson. So what is left for James to accomplish? 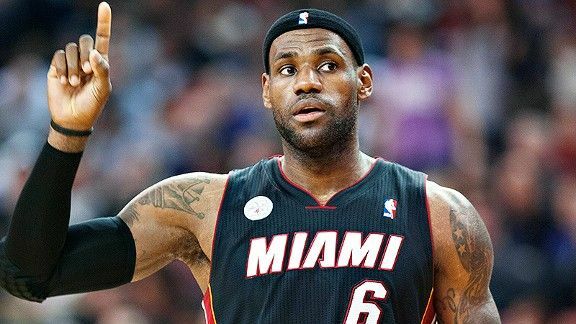 If the Miami Heat win the NBA title, he'd join Russell and Jordan as the only players in NBA history to win back-to-back MVPs and NBA titles.